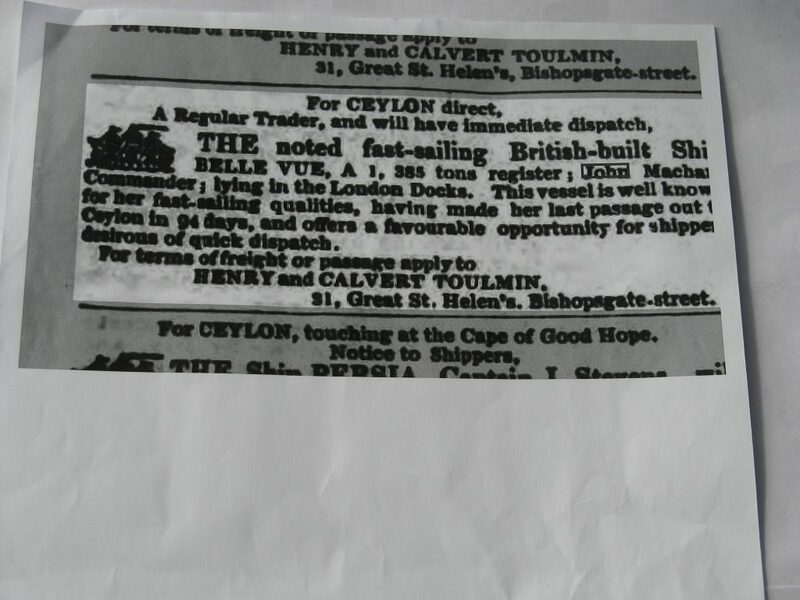 Shipmaster in command of a vessel for 14 years involved in the East India Trade. Later part of life shipowner and shipbroker. All the vessels he owned or owned with others were registered in Dundee and trading around the world. Shipmaster in command of vessels involved in the East India Trade sailing from the London Docks. 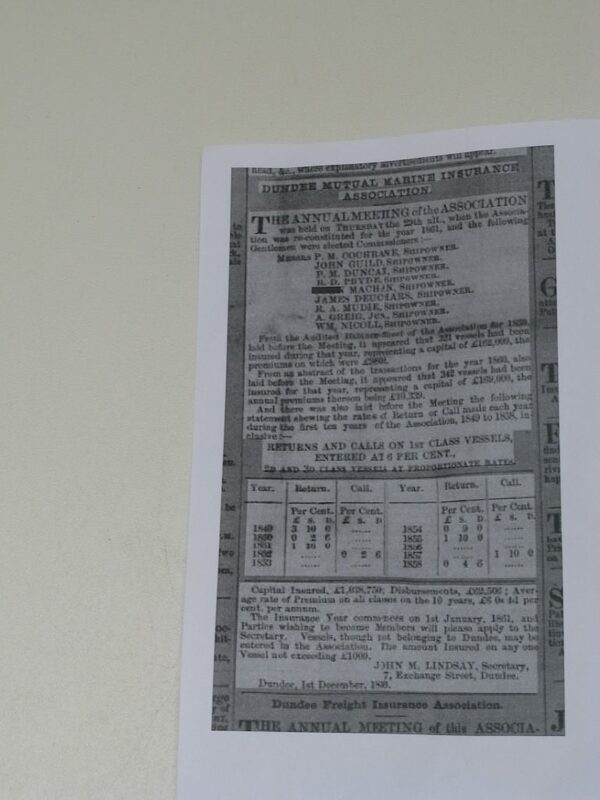 He received his Certificate of Competency as a Master from the Board of Trade on the 4th December 1850, when examinations of competency became compulsory in 1850. Later part of his life he was a shipowner and shipbroker with all the vessels he owned or owned with others registered in Dundee and trading around the world with import and export cargoes. 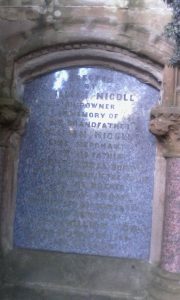 He owned several ships with his brother-in-law William Nicoll another prominent shipowner in the 19th century in Dundee. He was descended from a long line of distinguished seafaring shipmaster ancestors all recorded in The Fraternity of Masters and Seamen in the port city of Dundee. There is a historical recording: “At Dundie the tenth day of November 1677. This day meeting of masters and mariners of Dundie now admitted into their Fraternitie of Mariners John Machan and a David Machan on the 2 May 1678, skipper burgess of Dundee.” Records in the year 1833 record: “William Machan a Free Master member of the Fraternity unanimously elected Officer to the Incorporation in room of David Foreman, who from his age and infirmity is now unable to discharge the duties, William being enrolled to the same salary as David Foreman has”. A relative called John Machan, a shipmaster and burgess of Dundee, is recorded as residing at ‘The Shore’ in 1782. Also John Machan junior and William Machan are both recorded as Masters of the Helen of Dundee and residing at ‘The Vault’ in the early 1800s. The publication The Mariners of Angus 1600-1700 by David Dobson records a John Machane, seaman, in Auchmithie in 1614, a John Machan, skipper, in North Ferry of Tay in 1640 and another entry for John Machan, seaman, in North Ferry of Tay 1688.This publication also records a David Machane, sailor, in North Ferry of Tay in 1633 and another entry for a David Machan, skipper, in Dundee in 1692. One such family member was shipmaster John Machan, at one time master of the ship the Dispatch and in command of the Dispatch, the first ship to sail from Dundee to London on the 23rd January 1777 forming “Dundee’s Sea link with the metropolis“. The Helen of Dundee forms part of the inventory of the personal estate of John Machan, Shipmaster, in Dundee recorded in the Wills and Testaments in the Brechin Commissary Court in 1818. One third of the Helen of Dundee and her tackle was willed to William Machan and John Machan’s widow. John Machan followed his ancestors’ profession and at the age of 21 (in 1839) began his seafaring career as a shipmaster. Before this he was aboard ships on the River Tay. He was in command of a vessel as shipmaster for 14 years involved in the East India Trade sailing from the London docks. 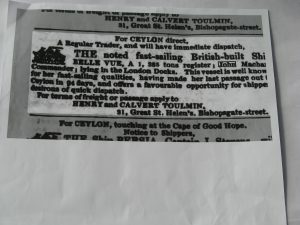 In 1849 he was the Commander of the British built ship the Bellevue on her passage to Ceylon “a vessel well known for her fast sailing qualities, having made her last passage out to Ceylon in 94 days“. He later named his house ‘Bellevue’ in West Broughty Ferry after the ship he commanded, . In 1853 he was the Commander of “The magnificent British Clipper-built ship“ the Indiana, on her voyage to Bombay from the London Docks. In 1852 he was commander of the Indiana on her voyage from London to Port Philip. In 1847 he married Elizabeth Henderson Nicoll whose family too were from a long line of Dundee shipmasters/shipowners well documented in the Fraternity of Masters and Seamen in the city. One such family member was William Nicoll, master of the Hope of Dundee and the Eliza of Dundee in 1796 and his son, William Nicoll junior, master of the Jean of Dundee in 1824, and master of the Martin of Dundee in 1818 and 1825. 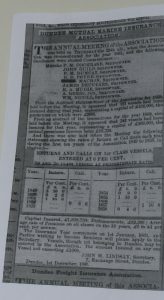 In the later part of his career he was a well known and much respected Dundee shipowner and shipbroker with all the vessels he owned or owned with others being registered in Dundee and trading around the world with import and export cargoes. He is recorded in the Register of Ships, volume 11, under M.S.A 1854, as owning several ships or as part share owner. He is recorded as owning the ships Lindisfarne, Mayfield and the Commerce. His ship the Mayfield was intended for the Dundee Baltimore trade (Red Diamond Line). He was a part share owner with others in the ships Ondine,Witch, Helen, Marian Moore, Success, Castle Roy, Balmuir, Jasper, Havilah and the Neva. The co-owner of the Balmuir, Lindsfarne, Helen, Havilah and Neva was his brother in law, William Nicoll. 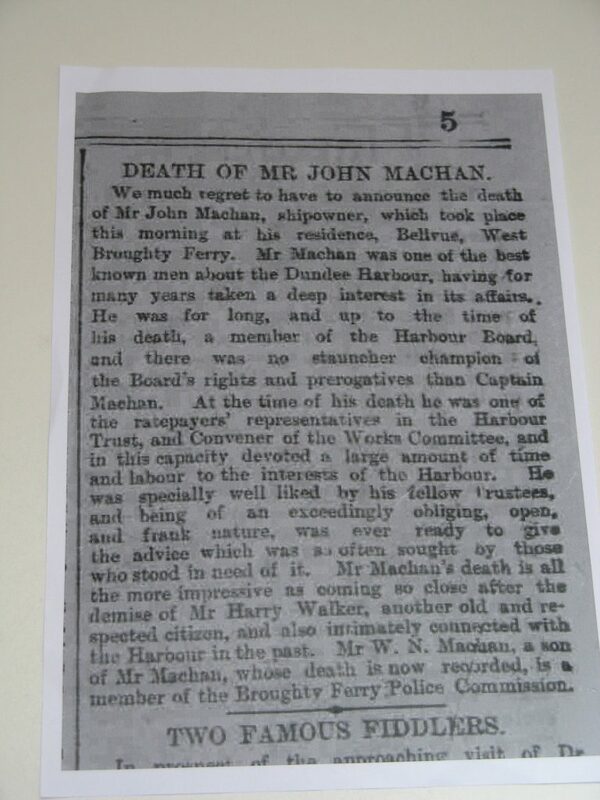 On the death of John Machan ownership of the Balmuir was transferred in 1891 to his son William Nicoll Machan. One of the ships owned by John Machan, named the Commerce, was reported in the Edinburgh Evening Courant in 1868 as being lost in the White Sea but the crew was saved. The loss took place on the ship’s outbound voyage to Archangel, under the command of Captain Norrie. On the 1st of July 1879 the Dundee Courier reports the loss and sinking of the Dundee barque named the Helen belonging to John Machan. It was on a voyage from Havana to New York with a cargo of sugar and collided with another vessel; the Captain and crew drowned. The publication Dundee Shipbuilding by J. P. Ingram records that John Machan’s ship, the Lindisfarne, on a voyage from Riga to Dundee in 1876 with a cargo of flax, sank the schooner Phennig of Hannover. The vessels collided off Falsterbo and the schooner sank in 10 minutes, with boats from the Lindisfarne being able to rescue the master and three of the crew. 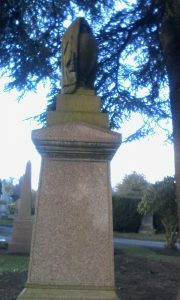 He was actively involved as Honorary agent of the Shipwrecked Mariners’ Society and Secretary of the Shipwrecked and Mariners’ Royal Benevolent Society. ” He was one of the best known men about the Dundee Harbour, having for many years taken a deep interest in its affairs. 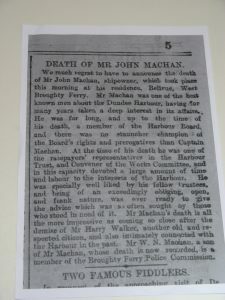 He was for a long time, and up to the time of his death, a member of and Trustee of the Harbour Board and there was no stauncher champion of the board’s rights and prerogatives than Captain Machan. At the time of his death he was one of the ratepayers’ representatives in the Harbour Trust and Convener of the works committee and in his capacity devoted a large amount of time and labour to the interests of the Harbour. He was specially well liked by his fellow trustees and being of an exceedingly obliging, open and frank nature was ever ready to give advice which was often sought by those who stood in need of it”. Old Parish Record. Dundee. Birth. 29 October 1818. 282/100/296. ScotlandsPeople website. Old Parish Record. Dundee. Marriage. 10 November 1847. 282/230/233. ScotlandsPeople website. 1861 Census Scotland. Dundee. 282/1 28/22, p.22 of 44, ScotlandsPeople website. 1871 Census Scotland. Dundee. 282/4 23/21, p.21 of 64, ScotlandsPeople website. 1881 Census Scotland. 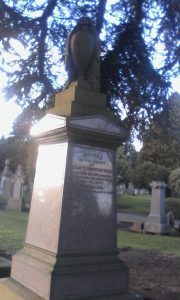 LDS John Machan Dundee. 199282, ScotlandsPeople website. Statutory Record. St Andrew's Church, Dundee. Death. 9 March 1889. Ref 282/4/209. ScotlandsPeople website. Burial. Eastern Cemetery, Dundee. 1889. Lair 764B. Find a Grave website. Nine Trades of Dundee. 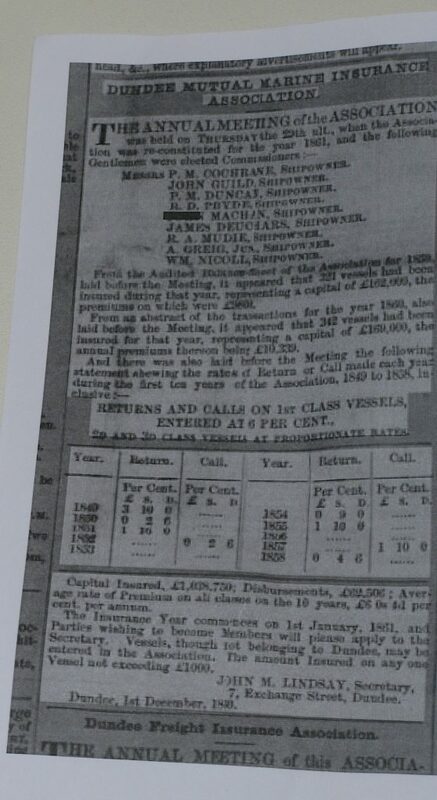 The Fraternity of Masters and Seamen in Dundee 1876-1900, Nine Trades of Dundee website. Dundee Evening Telegraph, 13 March 1883, p.4, British Library, British Newspaper Archive. Scottish Post Office Directories. Dundee Directory 1882-1883. 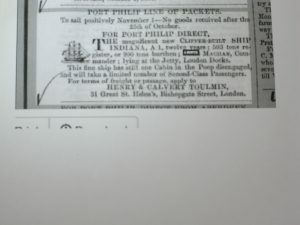 Harbour and Shipping Lists. p.70, Local History Department, Dundee Central Library. Aberdeen Press and Journal, 5 December 1860, p.1, British Library, British Newspaper Archive. Dundee Courier, 19 December 1861, p.2, British Library, British Newspaper Archive. Nine Trades of Dundee. The Fraternity of Masters and Seamen in Dundee 1851-1875, Nine Trades of Dundee website. Valuation Roll. Dundee. 1855. ScotlandsPeople website. Valuation Roll. Dundee. 1875. ScotlandsPeople website. Valuation Roll. Dundee. 1865. p. 275 of 305, ScotlandsPeople website. 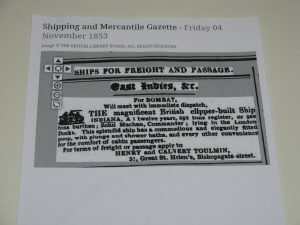 Shipping and Mercantile Gazette Friday 4 November 1853. 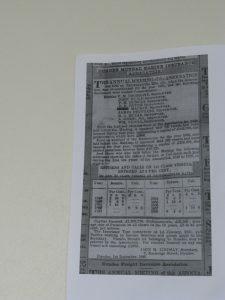 UK and Ireland, Masters and Mates Certificates 1850-1927. John Machan, 4 December 1850. Ancestry website. Registry of Shipping and Seamen: Registers of Certificates of Competency, Masters and Mates, Foreign Trade (1845-1906). BT 122, National Archives/Lloyd's Register Foundation. 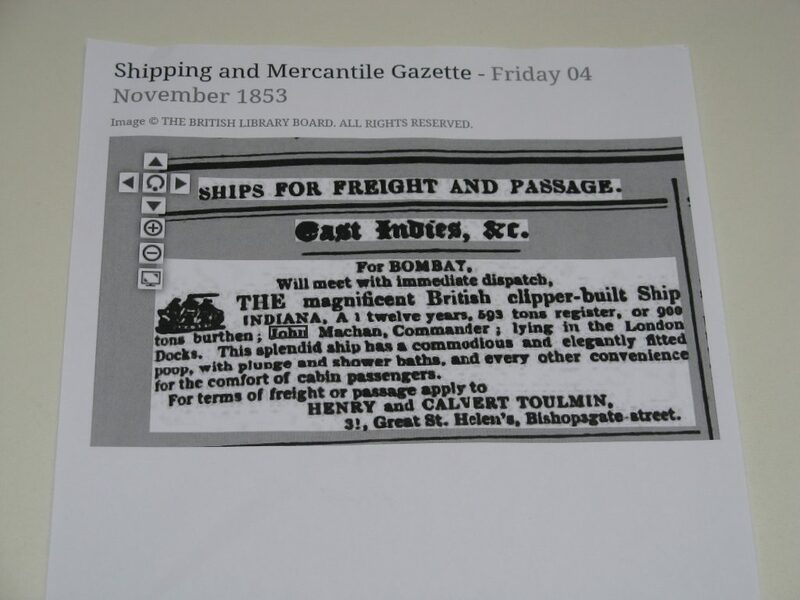 Register of Ships Volume 11 (under the Merchant Shipping Act 1854). Dundee City Archives. J P Ingram, Dundee Shipbuilding Volume 2, p. 44. Dundee Evening Telegraph, 18 March 1889, p. 3, British Library, British Newspaper Archive. Nine Trades of Dundee. The Fraternity of Masters and Seamen in Dundee 1530-2003, Nine Trades of Dundee website. Mariners of Dundee, 1513-present, The Dundee Lockit Book. The Burgess Roll of Dundee 1513-Present, Friends of Dundee City Archives. Dobson, David (2006) The Shipmasters of Dundee 1775-1825, David Dobson, Publisher p.24. David Dobson (1992), The Mariners of Angus 1600-1700, David Dobson, Publisher. Dundee Courier, 26 August 1911, British Library, British Newspaper Archive. Wills and Testaments. Brechin. 1818. Reference cc3/5/5 image 17, Scotlandspeople website. Dundee Advertiser, 5 January 1866, p.4, British Library, British Newspaper Archive. 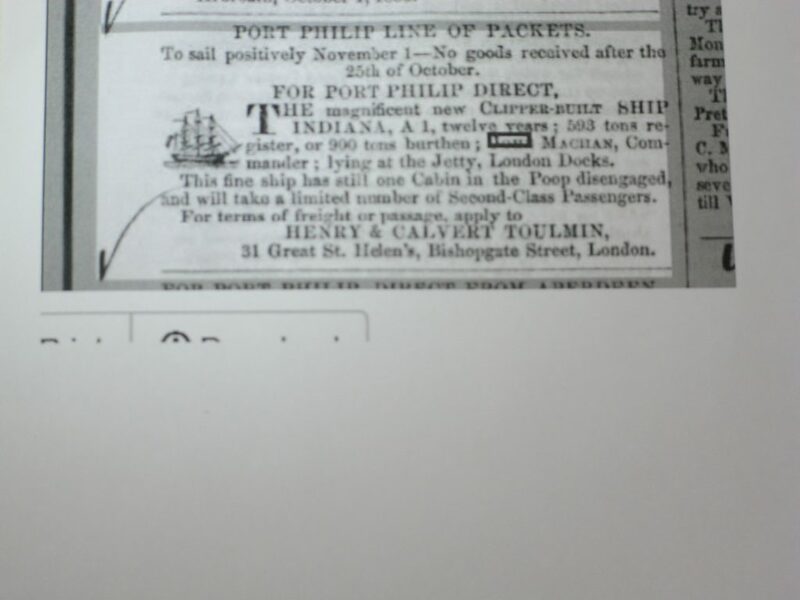 Shipping and Mercantile Gazette Friday 23 November 1849, p.1. Montrose, Arbroath, Brechin Review and Forfar and Kincardineshire Advertiser, 8 October 1852, 'Port Philip Direct, Indiana, John Machan Commander' British Library, British Newspaper Archive. Dobson, David (2006) The Shipmasters of Dundee 1775-1825, David Dobson, Publisher. p.29. J P Ingram. Dundee Shipbuilding Volume 4, p.12. Edinburgh Evening Courant, 16 September 1868, p.4, British Library, British Newspaper Archive. Dundee Courier, 1 July 1879 p.4, British Library, British Newspaper Archive. J P Ingram, Dundee Shipbuilding Volume 4, p.12. Dundee Courier, 15 March 1889, p.5, British Library, British Newspaper Archive. Thanks to: Dundee City Archives, Dundee City Library Local History Department, Anne Cowne. 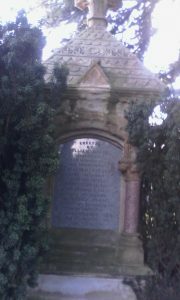 Lloyd's Register Foundation. The information above about John Machan has been collated from a range of digital and hard copy sources. To the best of our knowledge it is correct but if you are relying on any information from our website for the purpose of your own research we would advise you to follow up the sources to your own satisfaction. If you are aware of an inaccuracy in our text please do not hesitate to notify us through our Contact page.